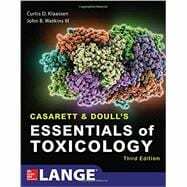 Casarett & Doull’s Essentials of Toxicology is an easy-to-absorb distillation of the major principles and concepts that were presented in depth in Casarett & Doull’s Toxicology: The Basic Science of Poisons, Eighth Edition, the field’s gold-standard text. Presented in full color, the book concisely describes the science of toxicology, and includes important concepts from anatomy, physiology, and biochemistry to facilitate the understanding of the principles and mechanisms of toxicant action on specific organ systems. A summary of key points at the beginning and review questions at the end of each chapter help you study, understand, and memorize the material. Succinct and comprehensive, there is no better text for gaining an understanding of essential principles, toxicokinetics, how toxic effects are passed on to succeeding generations, how each body system responds to poisons, and the specific effects of a wide range of toxic agents than Casarett & Doull’s Essentials of Toxicology.